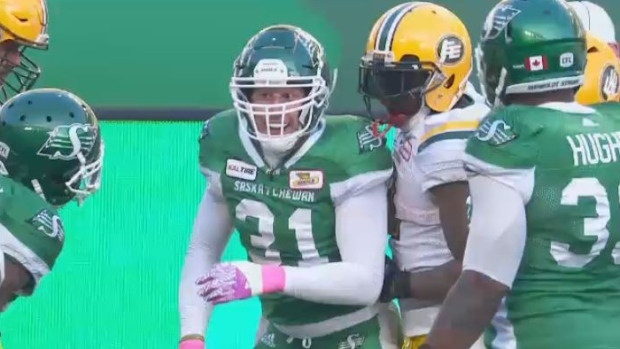 The Saskatchewan Roughriders have inked national linebacker Sam Hurl to a one-year contract extension. The Calgary product will stay with the Riders after signing as a free agent in February of last year. Hurl was originally drafted by the Riders in the second round, 12th overall, in the 2012 CFL Draft. He signed with the Winnipeg Blue Bombers in 2015 after three seasons with the Green and White. Hurl started all 18 games for the Riders last season, tallying 41 defensive tackles, six special teams tackles and two tackles for losses. He started for the Riders in the Western semifinal, picking up three defensive tackles. He was a member of the Roughriders’ 2013 Grey Cup championship. For his career, Hurl has 20 defensive tackles, 53 special teams tackles and eight quarterback sacks in 108 regular season games. Hurl was set to become a free agent on Tuesday.